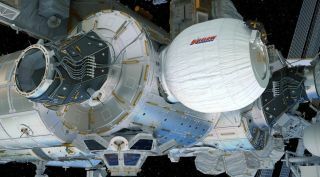 BEAM, the Bigelow Expandable Activity Module, is highlighted in its expanded configuration in this computer rendering. Built by Bigelow Aerospace as part of a mission partnership with NASA, the Bigelow Expandable Activity Module (BEAM) is the first privately built expandable room that has launched to the space station. Throughout BEAM's first year in space, researchers at NASA's Langley Research Center and astronauts on board the space station have studied the module's ability to withstand space debris, according to a statement from the agency. NASA astronaut Peggy Whitson and European Space Agency astronaut Thomas Pesquet inside the BEAM inflatable habitat that is currently attached to the International Space Station. BEAM is built out of a soft, expandable material similar to the synthetic fiber Vectran, which is used to make things such as rope and is used in some spacesuits. Expandable habitats like BEAM are less cumbersome to pack into a rocket fairing. Solid habitats built on Earth can be only as big as the rocket fairing they will travel in, but inflatable habitats make it possible to send habitats to space with a larger total volume than the payload fairing. Inflatable habitats could therefore play an important role in setting up lunar bases or Mars expeditions, according to NASA. "The BEAM technology demonstration is helping NASA to advance and learn about expandable space habitat technology in low-Earth orbit for application toward future human exploration missions" and the development of deep-space habitats, NASA officials said in the statement. Astronauts aboard the space station 3D printed a shield to cover one of the two Radiation Environment Monitors (REMs) inside the BEAM habitat. The shield, the white hemisphere at the center of the photograph, is shown inside the BEAM module. In the coming months, the crew will print successively thicker shields to determine the shield's effectiveness at blocking radiation. Though NASA researchers and astronauts will continue to monitor BEAM for debris impacts, their focus is now shifting toward understanding how the module stands up to radiation. That's because astronauts on future deep-space missions will be exposed to greater amounts of radiation than the space station, which is still somewhat protected by Earth's magnetic field, according to the statement. Two active Radiation Environment Monitors (REMs) inside the BEAM habitat measure radiation levels in real time. REM data has shown that doses of galactic cosmic radiation inside BEAM are comparable to those inside other areas of the space station. In addition, astronauts aboard the space station used the onboard 3D printer to make a radiation shield. Then, they used that shield to cover one of the REMs inside the BEAM to find out how well the space-made shield blocked radiation compared with the unshielded sensor. Two successively thicker shields measuring 0.13 inches and 0.4 inches (3.3 and 10 millimeters), respectively, will be printed and used to cover the sensor over the next few months. The goal of this test is to "determine the shielding effectiveness at blocking radiation," according to the statement from NASA. The astronauts aboard the space station are conducting additional tests to determine the safety and reliability of BEAM. The results of the BEAM project will ultimately help NASA move toward its goal to send humans on extended missions to the moon, and deep-space destinations such as Mars. BEAM was attached to the space station on April 16, 2016. After a false start, the module was fully inflated on May 28 of that year. Once the two-year demonstration ends, the module will be jettisoned from the space station to burn up during its descent through Earth's atmosphere.